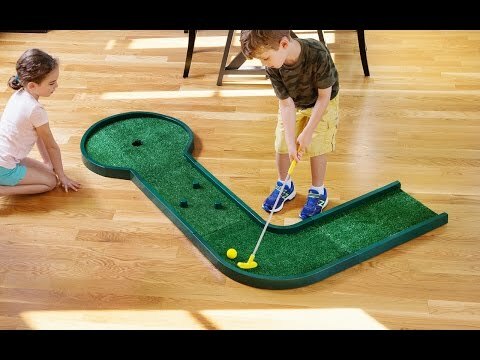 Customize your own modular mini golf set and play in the living room, garage, backyard, or office. Noochie Golf, invented by grade schoolers and brothers Tre and Dom, can be configured up to 25 different ways. The included golf ball is made of foam so it’s friendly to play indoors or out. Even grownups will enjoy a round—or several. Dimensions: 70" x 20" x 3"
4 yr old Grandson LOVES IT! I found this under "Shop Mens". I was looking for a birthday gift for an adult. I never took it out of the plan brown box it came in so I had NO IDEA it was for a child!! How embarrassed was I when the recipient opened it. It says for "6+ years old". This item should be listed under KIDS not adults. Very, very disappointed! The recipient took the gift and graciously said his children will love it. 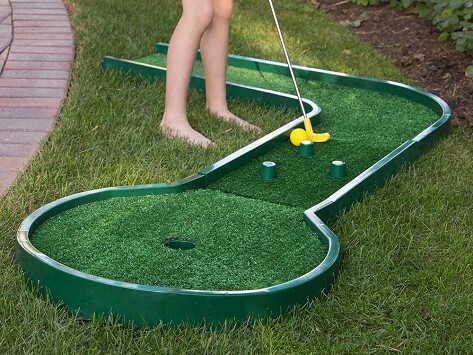 With this modular mini golf set, the nearest putting green is just around the corner—of your room, office, or backyard. Set up obstacles and reconfigure the interlocking pieces to challenge yourself or make creative use of your surroundings. Brothers and budding entrepreneurs Tre and Dom (a.k.a. “The Nooch”) came up with the idea for Noochie Golf after a mini-golfing trip—and before they even graduated elementary school. Their first prototype was made with plastic bottles, cereal boxes, and other objects around the house. They knew they were onto something. Their invention lets you putt putt in or outdoors—the soft foam balls are especially friendly for inside the house. Grownups can play, too. We admit to having more than our share of fun trying it out in the office. Luckily, doing a custom setup was super intuitive. Thanks to Dom and Tre, mini golf is now just a few steps (or office cubicles) away.